Now that the news about Google Chrome OS is out, I’d like to be the first to start a few new names for the operating system. From the Unix side of the naming ideas I come up with Google ChrOS which would be pronounces Google Crow-S (similar to the idea of BeOS). It could be shortened to read GOS, making it “short and cool” like Mac, but it just doesn’t have the same cool ring to it. Or how about Google COS? Or GhrOS? 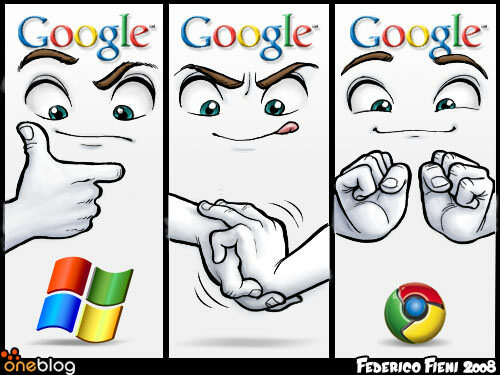 I’m not a big fan of the current name Google Chrome OS. Some would say that this is a very Mac naming system, but I think Google OS 1 would have been perfectly fine. Even if Chrome is later evolved to a point in the operating system that later barely resembles Chrome as we know it today it could still continue with this naming system as Mac OS did with 8/9 and then X which was completely different. News of Google Chrome OS has been spreading like wild fire through my Google Reader feeds and even via Twitter reaching at least 6th place on Trending Topics. With Google’s experimental project called Native Client (NaCl) in the works, it appears that Google is attempting to do something similar to what Microsoft attempted to do ages ago with ActiveX. Where Microsoft has (in my opinion) failed, it appears that Google’s Native Client may succeed at allowing support for web browsers to natively execute code for a deeper integrated position with…Google Chrome OS. With all of this news about Google finally graduating their entire suite of web apps (from what seemed like and eternal Beta stage to what is now considered final and safe for public usage) it seems all too clear that they have an evil plot to take over and dominant the PC world. Basically, Google will be using the Linux kernel to start up and run in the background and to handle hardware and software interactions. That is all in the background, things you won’t see all that much of. What you will see is that when you turn on your computer, instead of seeing the dominance of applications in the sense of executables, your applications will be web based applications that integrate nicely with the rest of the system. In fact, if Google is able to implement this operating system as I would love to have been able to do myself (had I of been able to of found the time) then it will integrate so tightly with the web applications that you will (hopefully) not notice a difference between the two. This is important for any operating system. The sense of integration is clearly important. Take a look at Mac OS X for example and their strict code of proper layout and design with a balance of clean and elegant user interfaces. If Google Chrome OS is able to bring this level of integration from the web and merge it with the general set of tools and applications provided then it just may be a success. With so much of our time being spent on the web already, will it really be that difficult to make a move to a web based operating system? Several tools are also available straight from the web, just proof that the web is the future! Take this web based screen recorded for screencasts provided by Screenjelly! You can watch most anything video-wise from the web already! The one thing that I’m really waiting for is for large amounts of storage in the clouds for a super cheap price! Chrome OS is based on Linux and is only available for Netbooks. 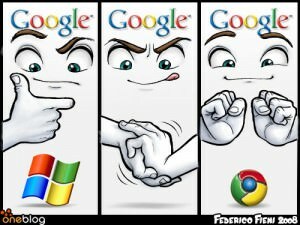 I wonder if Google would make an OS that would compete with Windows XP or Windows 7. I agree with you that it’s based on Linux so it will be difficult for it to compete. However, if you take a look at the success so far for the Google Chrome web browser it’s very interesting to see how well they have done and how quickly they gained a respectable market share and number of users. Advertisements on YouTube and Google search have to help them out a lot too though, haha. Chrome OS is just another rebranded Linux GUI, it would be much better if Google came up with an OS that would directly compete with Windows. Next Next post: New WordPress Twitter Badge Plugin!